Our company offers a wide range of Profile Cutting Machines- Gas/Plasma/ Spare Part, which are used in various applications of these cutting machines. We provide gas cutting tips, gas cutting nozzles, gas cutters, plasma consumable-electrode, heat shield, plasma cutters etc. Also welding counsumables of verous machines in standard sizes. These are also available in customized specifications and are offered at industry leading prices. 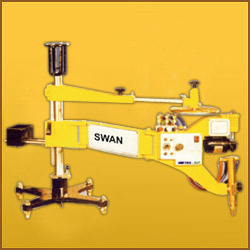 Profile Cutting Machine- 'SWAN' is a small portable radial arm oxygen cuffing machine. Being small in size and light in weight, the machine can be easily carried to the worksite and placed directly on the plate to be cut. As the machine is mounted on four ball castors it can be moved about on the plate as required. The tracing roller is magnetised by a solenoid coll and driven by an electric motor follows the edge of steel templates of virtually and shape guiding the cutting torch to cut the desired profile. S.C.R. Control ensures stable stepless sped variation and smooth running. Thrust ball and needle roller bearing used on rotating joints provide free and frictionless movement of the arms. Efficient design of rack and pinion systems ensures smooth and easy movement of cutter and template in both horizontal and vertical direction. The machine is constructed in three main section -Base and Column Sub-assembly, the Main Arm Sub-assembly and Top-Arm Sub-assembly. Magnet Tracing Roller: 12.7 mm dia. and 10 mm dia. Note: Any Movement of the machine should be done holding the base Plate. Do not use any other part for movement. Over the years, we have been appreciated and acclaimed in the market, offering a wide array of Portable Profile Cutting Machine. 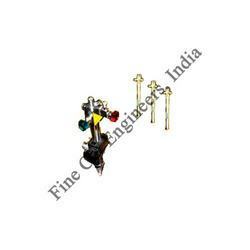 Considered for their very important features, our offered assortment finds its applications in many industries. To meet wide-ranging constraints of our clients, we provide these products in plentiful sizes and other similar specifications. Our obtainable collection has gained extraordinary value amongst our clients for its outstanding features. Counted as first among the best, we provide patrons with the superior quality of CNC Profile Cutting Machine. Manufactured as cross carriage type with a rigid tracing table, Portable CNC Profile Cutting Machine is ideal for cutting applications at workshops. 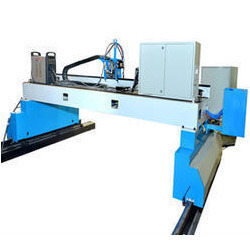 Our customers can avail the Portable CNC Profile Cutting Machine in various technical specifications. Looking for Profile Cutting Machines ?